임진왜란이 끝난 뒤 선조(宣祖)는 1604년 6월 25일에 임진왜란에 혁혁한 무공(武功)을 세운 이순신(1545～1598)을 효충장의적의협력선무공신(效忠仗義迪毅協力宣武功臣)1등으로 책봉하였다. 그리고 동년(1604)10월 29일에 이순신의 초상화(肖像畵)를 그려 후세에 전하도록 하고 관작(官爵)과 품계(品階)를 3자급(資級)씩 초천(超遷)하도록 하였다. 아울러 부모와 처자도 3자급씩 초천하도록 하되, 아들이 없으면 생질(甥姪)과 여서(女壻)를 2자급씩 초천하고 적장(嫡長)은 세습(世襲)하도록 하여 그 녹봉(祿俸)을 잃지 않게 할 것이며, 영원히 사유(赦宥)의 은전을 받도록 하였다. 또한 반당10인(人), 노비(奴婢)13구(口), 구사(丘史)7명(名), 전지(田地)150결(結),은자(銀子)10냥(兩), 내구마(內廐馬)1필(匹)도 사급(賜給)하도록 하였다. 약정(約定)된 사급노비(賜給奴婢)는 13구였으나 당시는 전란의 직후라 국가의 재정이 넉넉하지 못하여 사급하지 못하다가 이듬해(1605)정월 19일에야 비로소 전라도 부안과 고산, 충청도 온양과 천안 등지의 관노비 8명을 사급하기에 이르렀는데 이때 발급한 사패교지가 보물 제1564-(11)호로 지정되어 있다. 약정된 사급노비 13구 중 나머지 5구는 왜란이 끝난 한참 후까지 사급하지 못하다가 효종 4년(1653, 順治10)2월에 이르러 사급하게 되는데, 이때 작성된 교지가 바로 ‘이순신 사패교지(李舜臣 賜牌敎旨)’이다. 이에 의하면 경상도 안동부(安東府)에 배속되어 있던 예빈시·사재감·종친부 등의 노비를 지급하였던 것으로 나타난다. 정조대왕은 임진란의 영웅이었던 이순신에게 남다른 관심을 가지고 있었다. 그 결과 「정조실록」에 의하면 정조 17년(1793)7월 21일에 “생각해보면 충무공의 그 충성과 위무(威武)로서 죽은 뒤에 아직까지 영의정을 가증(加贈)하지 못한 것은 실로 잘못된 일이었다. 유명수군도독 조선국 증효충장의적의협력선무공신 대광보국숭록대부 의정부좌의정 덕풍부원군 행 정헌대부 전라좌도 수군절도사 겸 삼도통제사 충무공 이순신에게 의정부 영의정을 가증하라. 비석을 세우는 날의 치제(致祭)에 대하여는 전에 명을 내려 알렸는데, 벼슬을 추증하고 선고(宣誥)하는 일도 그날 함께 거행하도록 하라.”고 전지하였다. 정조의 하명에 따라 증직교지가 같은 날 곧바로 내려졌는데, 이때 내려진 교지가 바로 ‘이순신 증직교지(李舜臣贈職敎旨)’이다. 충무공 이순신의 사패교지와 증직교지는 역사적, 학술적으로 문화재적인 가치가 매우 높다. 이순신과 관련된 고문서는 교서, 유서, 유지, 무과홍패, 증직·증시교지를 비롯하여 별급문기, 이순신 처 방씨 고신교지 등 14건이 지정되어 있으므로 이순신의 1653년 사패교지와 1793년 증직교지도 지정할 가치가 있다. On the 25th day of the sixth lunar month of 1604, King Seonjo bestowed the title of meritorious subject upon Admiral Yi Sun-sin (1545-1598) for his outstanding service during the long war (1592-98) with Japan triggered by the Japanese invasion of Korea in 1592. About one month later, the king issued another edict to the effect that an official portrait of Yi be made for posterity, and that he be promoted by three grades in title and rank. 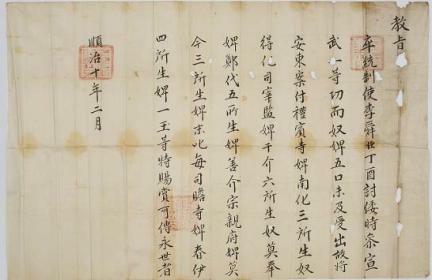 The king also ordered through this edict that Yi’s parents, wife and children be promoted by three grades and, if he had no male children, that his nephews and sons-in-law be promoted by two grades; and that his special privileges, including stipends, should be inherited by his eldest male descendants, and that they should be exempt from penalties permanently. The edict also conferred upon Admiral Yi ten pages, thirteen servants, seven callers, 150 gyeol (approx. ha.) of farming field, ten nyang of silver coin, and one royal horse. King Seonjo promised thirteen servants in his edict but postwar financial difficulties postponed the execution of the promise to the first month of the following year when the government was able to collect eight servants owned by the local governments of Buan and Gosan in Jeolla-do and Onyang and Cheonan in Chungcheong-do. The written edict issued at the time is now designated as Treasure No. 1564-11. Some fifty years later, in 1653 the Joseon government was able to fulfill the promise stated in the original edict by granting the other five servants. According to the royal edict issued at the time, the servants were collected from among those owned by government agencies in Andong-bu of Gyeongsang-do.